The other week I got my hands on a pink and a purple orchid. The purple orchid turned out to be a rather disappointing photography investment but of course I enjoy daily looking at it ... no hard feelings! The pink one on the other hand was a great find and allowed me to add 4 pictures to my existing Orchid Flower Fine Art Photography Gallery. If you are a regular visitor or reader of my photo blog you may know by now that I prefer to set up my close up photography studio next to our dining room window. This window faces east and provides exceptional and beautiful morning light bouncing off my neighbors' walls into our dining room. As a base for the flower I use a chair and books that I place in front of the window. Because I prefer working with natural light I use white cardboards to direct light towards the floral when it is facing away from the window. Adjusting the white boards to explore the impact on the lighting and better control the light on the flower is a great learning experience. It is a very delicate process and one has to watch carefully to notice the adjustment for maximum impact. I am still sometimes surprised on its affect and how it positively enhances the quality of a picture. In the final macro photography of the pink orchid I positioned the flower in the best possible way that allowed the right amount of back-lighting leading to a more pleasing floral image. I chose a small aperture setting (large f-stop number) of f/32 that provided sufficient depth of field and an exposure time of 5 seconds. During post processing steps I removed dust spots, adjusted lighting, contrast and color saturation before sharpening the final macro photography image of the pink orchid "Extremely Loud and Incredible Close". 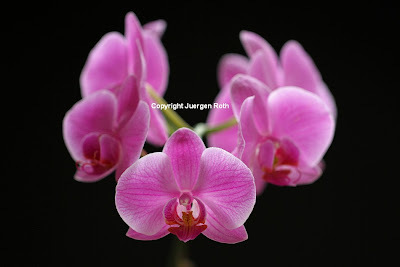 In the second floral image of the same orchid, called "Pink March Madness", I used a black card board in the background. I love using it because it makes the colors really stand out. The black backdrop adds elegance and emphasizes the grace of the orchid flower while the orchid itself epitomizes love, luxury, strength, and beauty. I applied a limited Depth of Field setting to draw all attention on the blooming floral dominating the foreground. By doing so I also created a sense of 3 dimensions within a 2 dimensional media. The aperture setting for this image was f/2.8 providing an exposure time of 1/40 seconds. During digital post processing I applied the same steps as mentioned above. Wow Juergen, another great read and stunning shots. What a beautiful colour. I have been enjoying all of your posting very much thank you for sharing. Juergen such beautiful photography! Your orchids are a feast for the eye! Very interesting & informative blog. Much success to you. Will be following your posts. Hi Jeurgen. I love your photos. Did you take any of the purple orchid? I'm a big orchid fan. The pink one is a phalaenopsis. My favourite kind is the Cattleya. There are many unusual and interesting orchids. An orchid grower or society would be a good source of exotic, beautiful subjects.